Mr Tomislav Šunjka is an expert in anti-corruption and anti-money laundering due diligence, examination of desk integrity and compliance, integrity and compliance, including assessment as well as in-depth, and ‘in situ’ investigations relating to entities or individuals, due diligence and assessment of tax matters, research, monitoring, analysis and advice, including assessment and development of policies, in the area of compliance-related anti-corruption issues. He practises asset tracing and asset recovery and represents victims of financial fraud, financial cases, bankruptcy cases, business and financial crime, political crime, high-level political and business cases, civil and commercial cases, damages cases, etc. His background is in business and transactional law. Mr Tomislav Šunjka is a regional representative member for Serbia and the Balkans of the International Bar Association Anti-Corruption Committee, a member of the asset recovery subcommittee and a member of the London-based ICC Commercial Crimes Services Fraud network – FraudNet. GTDT: What are the key developments related to anti-corruption regulation and investigations in the past year in your jurisdiction? Tomislav Šunjka: I would first like to point out that in 2013 the Ministry of Justice of the Republic of Serbia adopted the National Strategy for Combating Corruption in the Republic of Serbia 2013 to 2018. Also, June 2016 saw the opening of negotiation chapters in Serbia’s accession to the European Union; combating corruption is treated in chapter No. 23. The National Strategy foresees a body called the Coordinating Body for monitoring the Anti-Corruption Strategy, activities and measures. However, in practice, there are many problems in the functioning of this important body, which only rarely meets and is very passive in its work. The Constitutional Court also examines the constitutionality of the government’s decision to establish that body. The working group which was established to prepare the new law on the Agency for Corruption did not complete the final version of the draft law. It has been unofficially announced that selection of the new director of the agency is what is delaying it. Since Ms Magda Kršikapa was elected as the new director, it should be expected that the final draft of the law will be released to the public in the coming period. Although announced, a new criminal act of unlawful enrichment was not introduced in the Serbian legal system. The explanation is that it is contrary to the legal tradition of Serbia, in the sense that it corresponds more with the common law legal traditions. Regarding this, although it already has been announced for a long time, the law on detecting the of origin of property is still not adopted. This law, by proper application, would, in fact, firstly treat companies and persons close to the political structures in power. After the Venice Commission’s opinion on the depolitisation of the judiciary, amendments to the regulations on the election of the High Judicial Council and the State Prosecutor’s Office were announced. In many ways, daily politics has influenced the choice of judges, mostly through the rights of the assembly in this process. There are numerous remarks about passing laws without an objective public debate. The assembly itself, as the legislative body in this process, objectively does not have a dual role in the control of the executive or control of the proposed laws and their adoption, but only functions as a body that adopts the proposed laws without objective approach and control function. Amendments of the Constitution of Serbia were also announced. These changes should cover different areas, such as the judiciary, the electoral system and other. According to Transparency Serbia, the corruption perception index has not changed since 2008 and amounts to 72 out of 176 and 42 out of 100 respectively. The Serbian Institute for Standardization established a commission for translation of standard ISO 37001 – or ‘anti-bribery management systems’. The translation process is over and the standard started with legal application. We expect great results in its application. I was a member of the commission as an independent expert. This autumn, new regional anti-corruption centers should be established. These centers should officially start working on March 1, when the Law on Organization and Jurisdiction of State Authorities in the Fight Against Organized Crime, Corruption and Terrorism enters into force. The Law on whistleblower Protection was first introduced by the Serbian legislature in 2014, and was implemented in July 2015 (Official Gazette of Republic of Serbia, No. 128/2014) (the Law). While it is good to have the Law in place, unfortunately it does not provide a complete legal basis or framework for adequate whistleblower protection in accordance with existing international legal standards. The main problem is the absence of sanctions. For example, for important and common types of violation of a whistleblower’s rights, the Law does not stipulate criminal acts or offences, or even misdemeanours. The Law prescribes only mandatory monetary penalties, ranging from €400 to €4,000, if a legal entity has no internal policy on protection of whistleblowers or if it does not protect whistleblowers in the event of any kind of discrimination. The Law prescribes a mandatory monetary penalty of €180 to €1,800 for the designated responsible person in a legal entity if the legal entity does not have an internal policy on protection of whistleblowers or does not protect whistleblowers in the event of discrimination. As can be seen, the policy is for penalties to be set very low and, therefore, it cannot achieve its legal goal, which is to secure the protection of whistleblowers. Furthermore, other laws important for the protection of whistleblowers have not been amended. The Criminal Code, Data Protection Law, Employment Law, Civil Litigation Law and Enforcement Law do not recognise whistleblowers or whistleblower protection. We conclude with regret, therefore, that at present there is no valid, complete legal framework or basis for the protection of whistleblowers. In a public debate process, Transparency Serbia pointed out the risk of trivialisation faced by the institution of whistleblowing, since protection is not provided in relation to the reporting of serious criminal acts, offences or misdemeanours. The absence of any system of reward and the lack of explicit rights to fair compensation for whistleblowers were pointed out, both of which would be more important as motivation than simply measures to penalise retribution; the potential benefit to the public-sector economy was also highlighted. One positive thing is that, according to the Law, a whistleblower who discloses irregularities is afforded protection for term of up to a maximum of 10 years. The whistleblower’s family and associated persons are also protected. The Law prescribes three types of whistle‑blowing: internal, external and public. Internal whistleblowing is disclosing to the employer, external whistleblowing is disclosing to an authorised authority and public whistleblowing is disclosing through the mass media, the internet, at public gatherings or in any other way a disclosure may be made public. As regards internal whistleblowing, employers are required to appoint a person authorised to receive disclosures and act upon them, and to inform in writing every person in a working relationship with the employer of their right to protection in accordance with the Law. The problem is that this authorised person, albeit someone trustworthy and reliable, is an employee too, hence under full control of and dependent upon the employer. The Law does not impose an obligation upon the employer to appoint an independent professional (such as a lawyer, professor or academic) from outwith the legal entity in question as the authorised person (nor even recognise it as a possibility). The Law does not recognise any formal status for monitors or for monitoring undertaken in legal entities, state institutions, etc. A whistleblower may make a public disclosure without having previously made a disclosure to an authorised authority only in the event of an immediate threat to life, health, public safety and the environment, or threat of damage or to prevent direct damage and to secure evidence. While making a public disclosure, a whistleblower shall comply with the presumption of innocence in court proceedings, the right to privacy and the right to personal data protection, and shall not jeopardise the conduct of court proceedings. If a disclosure contains classified information, a whistleblower cannot make it public! The Law also prescribes that the employer of a whistleblower shall not put the whistleblower in an unfavourable position or cause him or her harm because of whistleblowing, particularly in relation to employment procedures, including status as an intern or a volunteer, work outside employment, education, training, professional development, promotion at work, disciplinary measures and penalties, working conditions, termination of employment, salary, participation in employer profit, awards and severance pay, relocation to another work position and place, retribution from third parties and referral for medical exams. The legality of an employer’s resolution on the rights, obligations and responsibilities of an employee whistleblower cannot be influenced by a lawsuit for protection arising from whistle‑blowing. The Labour Inspectorate is responsible for supervising implementation of the Law. The Law does not provide for monetary awards for whistleblowing; for example, in the form of a percentage of money recovered. Since this is the first time in the history of the Serbian legislature that such legislation has been introduced, the Law is one of the most important anti-corruption measures to date, and we hope that there will be possibilities for its improvement in future by drawing on existing international legal standards and experience. In this context, and in my opinion, in this phase of the development of the Serbian legal system and its harmonisation with internationally recognised legal standards and with the standards of the EU, it is very important to adopt a specific law defining criminal acts of corruption and the functions or activities to which corruption relates. When looking at the entire criminal legislation in Serbia, it must be said that appropriate legal structures and instruments are provided by several sources and laws. However, the legal presumption of the primary responsibility of the individual is still widespread, and victims are usually referred to civil procedure, which can last for years after the criminal procedure. While criminal liability of companies occurs in practice, there are no publicly available records and statistics of such cases. It is desirable to establish a case database similar to that of the World Bank, in which the corruption cases, reasoning and resolution of cases, sanctions, enforcement, fines and other details would be presented to public. This would reduce the current arbitrariness of approach and establish binding jurisprudence with its origin in the new Law, and would greatly improve transparency. GTDT: What lessons can compliance professionals learn about government enforcement priorities from recent enforcement actions? TS: The battle against corruption, in a legislative sense, has begun to establish adequate legal foundations, frameworks, instruments and mechanisms. In practical terms, law enforcement authorities have begun training their officers. Accordingly, compliance professionals have to identify and determine risks in more detail, determine measures for preventive disposal of risks, procedures of control and supervision, procedures and mechanisms for corporate investigations and for the efficient disposal of manifestations and consequences of the phenomenon of corruption. TS: The absolute key area is high-level political corruption, and after that bribery of officials and political parties, and then bribery in public procurement procedures – when procuring goods, works and services – as well as bribery and trading in influence at different levels. Companies need to focus on the risks inherent in procedures related to various corporate social responsibility projects, sponsorship of schools, sports clubs, various forms of financial support of municipalities, city and other governmental organisations and entities. There must be absolute transparency in companies’ media plans and marketing. Companies need to build an internal system of control when participating in the public procurement of works and services. When investing, it is crucial for companies to perform anti-corruption due diligence, along with standard due diligence checks. M&A risk-based due diligence and disclosure procedures should contain thorough risk-based anti-corruption due diligence checks on potential business acquisitions. Furthermore, it should be ensured that the acquiring company’s code of conduct and compliance policies and procedures regarding anti-corruption laws are applied as quickly as possible. Training on the anti-corruption laws and the company’s code of conduct should be conducted for the directors, officers and employees of acquired businesses or merged entities and, when appropriate, training of agents and business partners as well. Also, a specific anti-corruption audit of acquired or merged businesses should be conducted and any corrupt payments discovered disclosed. TS: Criminal legislation changed with special emphasis on criminal acts in the scope of business crime, introducing seven completely new criminal acts. Amendments concern new criminal acts connected with fraud in performing different business activities and the performance of duties, responsibility of persons who exercise monitoring, as well as responsibility of board members. The offence of receiving and offering a bribe in business has been introduced for the first time in relation to private companies. The penal policy is tightened, by stipulating stricter prison sentences. In terms of criminal procedure, changes are envisaged in terms of introducing different officers in various state institutions such as the business register, the cadastral office, the stock market, etc, with a goal to improve communication among state bodies. The concept of forensic officers, various advisers of the prosecutor, tax, accounting and stock market experts is introduced, in order to improve preparation and conduction of investigation. Prosecutors are permitted to form ad hoc special teams/task forces with members of different expertise and specialties. The training will be done in the judicial academy during 2017 and the first action is expected in the year 2018. In this regard, the companies will have to first check their own business, to introduce their own procedures and anti-corruptive compliance programmes, perform integrity checks for their business partners and to refuse to participate in activities where bribe, corruption or trading in influence appears in any way. GTDT: Have you seen evidence of increasing cooperation by the enforcement authorities in your jurisdiction with authorities in other countries? If so, how has that affected the implementation or outcomes of their investigations? TS: I personally still do not see evidence of increasing cooperation between national authorities and authorities of other states, for a number of different reasons, from interstate and political factors to the relationship between countries of different sizes and importance. Local authorities’ may also lack technical and legal knowledge and have to turn to foreign authorities for some form of international legal assistance; for example, lack of knowledge as to which cases the foreign prosecutor will approve assistance for, or what should be emphasised when forming requests for international legal assistance, knowledge of the legal system of the country in question, whether the criminal offence for which the perpetrator is being prosecuted constitutes a criminal offence in the country from which assistance is sought, whether a specific country provides legal assistance for such crimes, etc. It is necessary to know all of this for every particular jurisdiction from which legal assistance is sought. 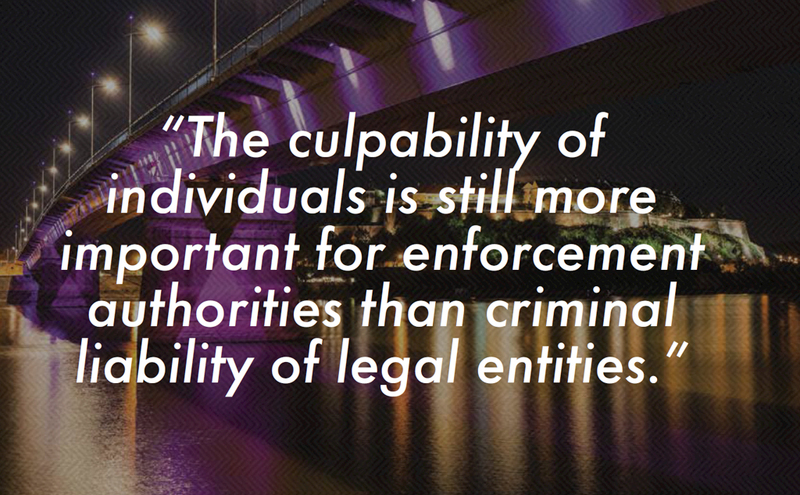 TS: It must be stressed that the culpability of individuals is still more important for enforcement authorities than criminal liability of legal entities. However, criminal liability of legal persons is gaining relevancy. In this context, we must distinguish at least two general types of case. First, when the criminal behaviour of the individual responsible is simply a business policy of the employer corporation, whether a covert policy or even public, covered by investment support from politicians in power; or second, when the individual responsible has neither the public nor the tacit support of the corporation for their actions, but performs criminal acts out of personal greed, ignorance or individual criminal intent in pursuit of benefits. Recently, we have had a number of enquiries from corporations where individuals from those corporations were subject to investigations. These enquiries mostly consist of questions regarding the legal consequences a company faces in relation to investigations into the conduct of company managers, whether the company should give support to the manager in a particular criminal procedure, or whether the company should assume the role of victim and assist the prosecutor in presenting and indictment against the company manager. While the advice varies from case to case, one thing is always clear: it is necessary to do as much as possible in the way of prevention. This can be done by implementing anti-corruption measures, programmes and procedures; through constant training; by insisting on putting business ethics first, and results and profits second; and by insisting on personal integrity, company integrity and economic integrity in general. TS: Developments in data privacy legislation have not slowed or prevented cooperation with government services and corporate investigations into possible corrupt activities. All court and prosecution decisions must be implemented without exception, so where a matter is subject to confidentiality, official secrecy or privilege the court will revoke those protections, and thereby obtain the necessary information. All other data in accordance with the law can be used in various investigations and procedures. An adviser in the anti-corruption area has to be well acquainted with local political influence, levers of power, ways of thinking, habits and the mode of operation of political parties, groups and individuals. On the basis of such knowledge, an adviser can, on one hand, counsel companies on how to create their rules and internal policies, to preventively eliminate potential risks of corruption. On the other hand, when it comes to an actual anti-corruption case, an adviser has to be sufficiently independent and strong to initiate, manage and lead in the event of such a crisis. While anti-corruption compliance is a new and unexplored field in Serbia, there exist at an international and global level rules and experience to draw on. Serbia is yet to harmonise its legal system with the norms and legal regimes that are well established internationally in the field of anti-corruption and in other fields. It is necessary to achieve cooperation between the law enforcement agencies and experienced advisers for many reasons, including educational purposes, to point out the importance of the subject of protection, and the consequences and benefits for society itself, both in the broader sense and from the point of view the direct victims of corruption. It is also necessary to fight for clients’ interests among the different interests of various power elites. Anti-corruption cases are very complex and sensitive. Circumstances in particular cases can make matters ever more difficult. One case concerned a high-ranking public official who had dual citizenship, owned assets and had family and business partners in several jurisdictions, and who was taken into long-term detention. All these circumstances in conjunction with his high ranking made the case unique – complex in a legal sense, from an anti-corruption, criminal and civil point of view. I truly believe that anti-corruption legal practice is a step up; a practitioner has to be very competent in business law to understand transactions, offshore structures, internal procedures, compliance, public procurement and criminal law, and one needs a broad insight into the political system.